Seth Godin has a blog post called “How to Draw an Owl” which goes into great detail of how to draw an owl, starting with two circles. Click here to see it. The problem with most business and leadership advice is that it’s a little like this…The two circles aren’t the point. Getting the two circles right is a good idea, but lots of people manage that part. No, the difficult part is learning to see what an owl looks like. Drawing an owl involves thousands of small decisions, each based on the answer to just one question, “what does the owl look like?” If you can’t see it (in your mind, not with your eyes), you can’t draw it. Godin is railing against technical conferences that show how to get somewhere without showing the finished product. The church parallel is that there are at least two types of churchy gatherings: instructive and celebrative. To Instruct is to show how to get from two circles to an Owl. These are the Evangelism conferences that fill my inbox, the conferences that show the “nuts and bolts” of how to get through a ministry process. While often helpful, they are often not transformative to individual churches or clergy because the process for every church is different. 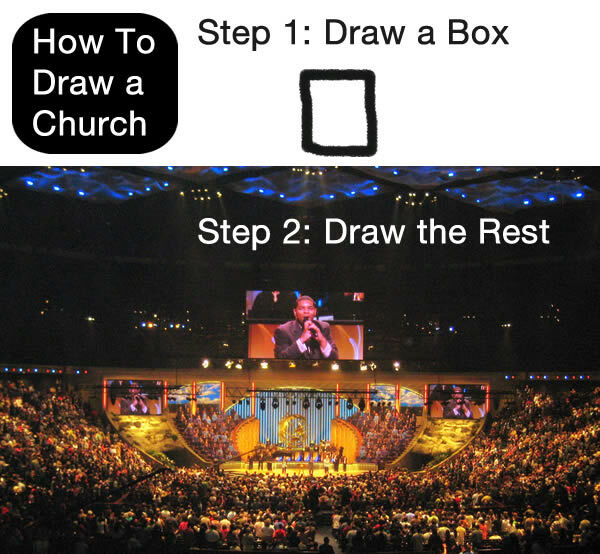 Just as drawing an Owl requires deciding where to start, each church starts from the “conference method” in a different area and sometimes they just don’t overlap. Sometimes they effect awesome change; sometimes it is just off the mark. To Celebrate is to bring out the Owl and celebrate it. Every year Methodists and other church groups sit through Annual Conferences or gatherings and hear how other areas of their denomination or region are doing. The ones that are usually the most attention-inducing are the ones that celebrate transformation: ministry with criminal justice ministries, with addiction recovery, with children and youth, with relief efforts, and other areas that show stories of transformation. While we can consider and think about “how did these people get transformed” the bulk of the report is on “these are the people who were transformed.” And it’s awesome, though sometimes not “transformative” to our own contexts. Whether you start with the vision of what can be, or you start with the “here’s our tools, what can we start building” the point is that a vision grounded in praxis is the most important part of growing a church, sustaining a mission, or helping a church transition into something new. Thoughts? Is vision the most important part of a ministry? Or is the process more important than the product? I don’t know if the process is more important than the vision, but it might be as important. We are walking a road together and may never really see the end “product.” So the way we journey is as important as the vision that is guiding us. And, like you said, the instructive stuff almost seems to assume that “one size fits all” when it comes to ministry, which is blatantly unrealistic. When it comes to *communicating* church and faith, I fervently believe that vision must be informed by and anchored in realistic, actionable articulations. So many of the churches (local and judicatory levels) I work with come up with mushy stuff like, “We believe Jesus is Lord” or “We live the Gospel” when asked about message; and “the unchurched” or “everyone” when asked about audience; or flat out unrealistic stuff like “people in pews” when asked about goals. In my corner of the church world, vision without strategy and process is nothing more than lovely chatter. I might say that it’s the way in which we communicate our vision that must be anchored to “realistic, actionable articulations.” Hence, to proclaim “We believe Jesus is Lord” is a mushy statement when that proclamation is never lived out in the lives of the local church… which easily occurs where serious commitment to Christian discipleship is lacking. However, to proclaim “Jesus is Lord” in the context of a community that faithfully carries out Jesus’ teachings about life within the Kingdom (feeding the poor, clothing the naked, binding up the broken, walking the extra mile, handing over your second cloak, turning the other cheek, building fellowship upon restored relationships following confession and forgiveness, etc.) is an incredibly powerful message. Paul could say to the church at Philippi, “Not that I have already attained, or am already perfected; but I press on, that I may lay hold of that for which Christ Jesus has also laid hold of me. Brethren, I do not count myself to have apprehended; but one thing I do, forgetting those things which are behind and reaching forward to those things which are ahead, I press toward the goal for the prize of the upward call of God in Christ Jesus.” Not a lot of concrete examples here, but Paul is speaking of the fulness of salvation, living as one who is entirely sanctified, perfected in love… in which his own desire follows after the will of God. Perhaps we don’t have to lay out a list of the tangible actions that characterize what it means to live into that vision, but the vision itself has to be clearly articulated and the life of the one articulating it MUST reflect that same vision. There’s a lot to be said for developing skill at using the tools offered by these conferences and workshops, but knowing how to use the tools alone isn’t enough. We need to gain better knowledge of those people we’re trying to shape with those tools. I can safely use a blowtorch to soften metal enough to bend it, but I’ll destroy a piece of plastic trying to do the same thing. It’s not a matter of having the biggest, baddest tool at hand but using the right tool given the material to be worked on. You don’t have to be a supporter of Rick Warren to recognize his success at Saddleback Church. Hundreds, if not thousands, thought that if they wore Hawaiian shirts and offered a coffee-house church culture that they could duplicate his success. What they failed to grasp was that Warren had methodically learned who the people in his community were so that he could develop a church that spoke to their needs. Because Warren is in Southern California, the casual attire and coffee-house culture worked. The same shirts wouldn’t fly in North Dakota, no matter how hard to tried. But if the North Dakota pastor really sought to learn from Warren, he or she would take time to study the local culture to learn what is spiritually lacking and then determine how the local church can best address that need.